Think washable nappies, and most of us will envisage a burdensome, time-consuming – not to mention smelly – commitment reserved only for the most dedicated eco-warrior. “Cloth bumming”, as it’s called in inside circles, is no longer just about the environment or saving money, but also about fashion and the clamour to get the most sought-after designs on your baby’s bottom. The full-time midwife is now a cloth nappy “influencer” with more than 22,000 Instagram followers. Like the vast majority of “real” nappy users, the 32-year-old from Edinburgh originally set out on her “cloth journey” to reduce plastic waste and save money but, over the years, it became a hobby. “I fully intended for my use of cloth to be solely functional. But, once I started, it became more of a case of wanting all the pretty patterns. I joined quite a few communities online, where there was a lot of hype about having all the prints. “I’ve got a lot of limited editions, which sell out quickly. It became a bit of a game trying to track them down – I used to source them from Canada, Australia and the USA. And doesn’t owning so many nappies defeat the object of a reusable product? “I do get some negative comments about the size of my collection. Yes, it’s more than I need, but those nappies were bought at independent shops, so it’s keeping people in jobs, and I use every single nappy I own: none of them just sits on the shelf. 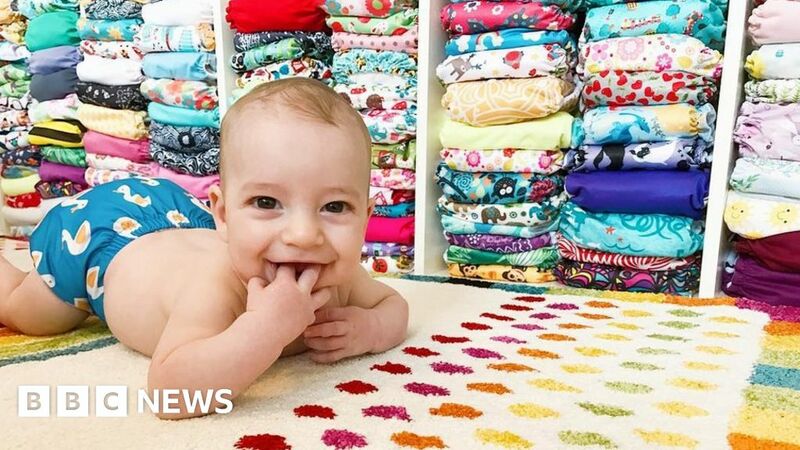 Nicola Vandenbrouck, mum to 17-month-old Drew, admits she’s become passionate about colourful cloth nappies. “I bought it and a couple of others, just because they looked cool. “Off the back of that I started to get into some of the Facebook groups, and it all took off from there and became an obsession,” says the quality engineer from Great Torrington in Devon. Zoe Davies, who runs a “nappy library” in St Austell, Cornwall, says using “real nappies” helped her cope with postnatal depression following the birth of her son, Theo. “It’s something to look forward to, with new prints coming out, and they’re all happy colours. When you see them hanging out on the line it’s pleasure to see – it’s a really wholesome thing. “We made 500 royal baby nappies and they sold out within an hour and a half. The website crashed. The retailers’ sites crashed,” she says. Mrs Smyth adds: “Parents can be quite fanatical [when a new range is about to be released] and start stalking your website. They want to be the first person to buy and get them ‘OTB’, or ‘on the bum’, and get their pictures on social media. Carly Baillie is head of product at Northampton-based Bambino Mio, and manages the brand’s design output. “People really care about what their children are wearing. They like to make a statement,” she says. Mrs Baillie says Bambino Mio has many loyal fans it describes as “collectors of the brand”. “It does become a cult. A lot of parents buy the whole collection in one go. People write to tell us about their collections and ‘stashes’, or to request a discontinued print. “Customers compete, in a sense, over who has the biggest and best collection and who can get their hands on all the different designs. We’ve produced a chart, so people can tick off the nappies they’ve collected.